Steven Butala: “They’re going to call me back. They’re going to send me their letters. What if I can’t buy other property?” We’re going to try to address getting and staying organized with this, and we’ll try to alleviate some of your concerns, because between the two of us, we completely have it covered, because we failed at it for the last 20 years. Jill DeWit: I would argue that we were successful at it, otherwise we wouldn’t be sitting here, by the way. Steven Butala: We have been tremendously successful at this the last 10 years, which is right about the time that Jill got involved. Jill DeWit: Thank you. That’s what I wanted to hear. Okay. Michael asks, “Hello. So an elderly couple didn’t like the deed language.” That’s hilarious. “In quote, ‘That for, and in consideration, of the sum of $10 and/or other valuable consideration.’ End of quote. They said that’s not the amount they’re being paid. Guess they didn’t notice that when I email them the deed to verify all the details were correct. After that spooked them, they didn’t trust the cashier’s check from my credit union.” Oh, my gosh. Jill DeWit: I have never really had it happen. Steven Butala: I have, jeez. Jill DeWit: To get to this point where we couldn’t solve it … But I have had them wonder what the … Because every state has different types of deeds, and the wording will be a little bit different, but one thing is the same. You never put the actual amount on the transaction, on the deed, just like when you buy a car. Jill DeWit: When you sell a car, the only thing that’s on there might be the odometer reading and then who’s selling the car. Remember on your pink slip that you sign? But you don’t put in there how much you sold the car for. You have a totally separate bill of sale, and that’s kind of like what we do here. The purchase agreement was a separate bill of sale, so if they need that for their accountant, for taxes, for that purposes, but nothing that’s needed on the deed. Steven Butala: How property conveys in this country dates back to the 1700s during the homesteading time. When property was conveyed back then, it was conveyed for good and valuable consideration, and very often it wasn’t for money. It was for a couple of mules, it was for all kinds of stuff that went on, or very often people would get married and people would deed them properties as gifts. It was a whole different program. Steven Butala: Fortunately or unfortunately, we’re stuck with that system now, probably forever, or at least our days. Good and valuable consideration is how property is conveyed. In fact, love used to be in that sentence. For love and/or good and valuable consideration, like I’m deeding my properties to my kids. That somehow works its way up, but that $10 in that sentence has just never gone away and it freaks people out. They think it’s a scam. Steven Butala: If you look at every deed, it says $10 in it. It’s hard to convince people who are skeptical already to just accept that’s how it is. The only way I would do it is just show them, “Here’s 500 examples of how it’s done all over the internet.” But if you were dealing with an elderly couple, I would turn that over to Jill, personally. Jill DeWit: The easy way, too, is I would take Mr. and Mrs. Smith and, “Let’s go look at the deed that you bought the property on. Did you pay $10 when you bought the property?” “No.” “That’s how it was conveyed to you.” “Oh, hey, you’re right.” “And that’s how we’re conveying it, continuing on, because that is how it goes.” Was there a second part of that? Steven Butala: The question really was how do you talk people down from this situation and get them back to re-trust you? Jill DeWit: Just explain it? Steven Butala: I’ll tell you, my ridiculously … If Jill weren’t involved, I would say, “You know what, elderly couple? Have a nice day. Because I haven’t opened today’s mail yet and there’s probably 10 more deals in there, and it’s too bad you don’t get it.” That’s honestly what I would say. Steven Butala: I hate to give that kind of advice, because we’re probably at a different point in our career than you are, but I don’t know. Is that where we are? Jill DeWit: Is that where we are? Heck, yeah. Steven Butala: Would you make a special phone call and say, “Hey”? Jill DeWit: I would try. I would totally try, but I wouldn’t argue with it. I wouldn’t fight it. If it got to that point where it’s just not going to happen, I’m going to walk away. It’s not worth my time. It’s not worth spending half a day going somewhere else. “Okay, I’ll get you a money order. Do you want a certain type? Do you want an American Express money order?” Whatever it is. I’m not going to run all over town and try to do that, because I have five other deals from all of their neighbors that want to sell to me. Steven Butala: Along these lines, just as you … This is a big-picture concept on how to run your business. I have used this sentence a million times. I do not want to make or force you to do anything you don’t want to do. We buy and sell property, and we buy it cheap and we sell for more. If this is in any way outside your range of comfort and something in your gut’s not making it feel right, which by the way happens with people who are not internet users, because if you go on the internet and check us out, we’re legit. But if you just have to take our word for it, that’s hard for anybody. Steven Butala: I think, this day and age. So I usually just say, “This is clearly not within your risk threshold, so let’s just call it. Let’s just not even do a transaction,” because if something does go wrong down the line, they’re going to blow their tops. Steven Butala: It’s not worth it. It’s just another deal. Jill DeWit: It’s not. Good answer. Steven Butala: Today’s topic: Managing acquisition deal flow. Managing the acquisition deal flow that you’ve created for yourself with these mailers that we’ve been talking about all week. This is the meat of the show. Jill, give us a little background about why you think people refrain from sending out mailers. Jill DeWit: Because then people are going to call. People are going to respond. People are going to act on their offers, and then they’re like, “Now what do I do?” That’s why we’re here. We help you with that. You know what to do. We talked about it a lot. We talk about it on the show. We talk about it on our member calls. We talk about it in blogs, in our content, everything out there. We talk about it. So I think that’s funny that that’s one of the things that people are … They’re a little worried about, and they’re worried that they did it right. Jill DeWit: You know what? There really is no right or wrong. Whatever you offer is probably appropriate. That’s something we don’t usually talk about. There’s no magic chart that we say, “You need to take these three numbers, divide it by .2, divide it by another .5, multiply it by this, and that’s the actual thing. It’s a scientific thing, it works every time.” Could you imagine? Steven Butala: Boy, sign me up for that. Jill DeWit: Right? Here’s a formula, plug it in, you’re golden, have fun. No. It doesn’t work like that. You know what? It’s the same as everything. Steven Butala: If you send a mailer out, people are going to respond. Steven Butala: There’s two ways to keep track of it. The first way is on a computer in some form of CRM, however you see that. We’ve deliberately, Jill and I, not really gotten down to this level of detail on how you should manage your business, because there’s other people that are better at CRMs than us. But I’ll tell you what, there’s nobody better at buying cheap land than us, and how to do that. Steven Butala: So get organized. Here’s how we do it. We have a spreadsheet with three tabs in the bottom. Acquisitions, engineering, and sales. As the people call back, or they send their letters back, it goes into engineering, a line item goes in there, and they fill out, whoever’s answering the phone for us, in your case it would be you … You would ask several questions. Steven Butala: On acquisitions, and they would fill the stuff out, and you’re basically asking them questions to see if the deal works. Do the economics work? Do the maps work? Does their access? You’re using [ParcelFact 00:09:04] and some other tools to find all that stuff out, and if it all works you move it into engineering, because you’re in the process now of buying it. Jill DeWit: Yeah, you buy it. Steven Butala: Then a second part of this, which Jill’s an expert on, is actually the phone conversation and talking to them when they reach out to see, “Hey, is this legit? How does this work? Yeah, I do want to sell my property for 5,000 bucks, but I have a bunch of questions.” Jill, go ahead. How do you manage that? Jill DeWit: There’s a couple of ways to do it. Early on in the beginning, I just kept … Because we’re talking about managing the deal flow, so Steven just talked about the reporting parts of the property details, which is usually the easiest way, especially when you’re new, is just have an Excel file like you talked about. There’s different tabs at the bottom, that you move things through the process. Once the call comes in, where you document it, and you do your due diligence, when you buy it then you move it to another tab, now it gets ready to be posted, and then when it’s posted and sold, now you move it to another tab. That’s that part of it. Jill DeWit: But the communication part of it, there’s many different ways you can do it. You do not need to get a fancy CRM. You do not need to spend the money on that. Do you know what’s funny? What I did in the very, very beginning, and it worked well for me for a pretty long time, I would sit down at my desk and I would open up, kid you not, a Word document. I have a blank Word document, and it was a running document that I’d have a date when I started it. Imagine the old days when you used to have a check register. Remember, you’d have the start date of your check register and the end date of your check register and the check numbers in between. I’d have multiple Word documents, but I’d usually keep one open for a month at a time. Don’t know if you knew about this. Jill DeWit: Did you know about this? Okay. Steven Butala: No, I never knew. Jill DeWit: Every day, when a call would come in, I would just start typing in that Word document, and then I’d clean it up after the call. Or if you’re not that fast, or you don’t want to hear them clicking, you could write it down and then put it in the Word document after you hang up the phone with that person. I would put in the day that the call came in, the time that the call came in, their phone number, and all the information about the call, and then I would highlight in different numbers, different colors if I needed, depending on the action that needed to happen. Jill DeWit: So let’s say 10 calls came in today from the offers that we sent out, so I’d have them all listed in there. Three of them were people that said, “Get me off your mailer.” Fine, they’re not highlighted at all. It’s like a move on situation. Two of them were like, “Ready to go. I’m in.” Those were in green. Then the rest of them were like, “I don’t like the offer price. I would do this offer price.” Those I need to talk to you about, I would need to work on with you, and those would be a different color. It was that kind of a deal. Steven Butala: I want you to. I’m taking a picture of us. Jill DeWit: That’s a whole different conversation. Steven’s going to take a picture of us, but will you take a picture of us that direction, not this direction, first? Anyway, that was good. Steven Butala: Here’s the good news. This is the real meat of the show. Jill DeWit: I think that was the managing it, so yeah. Steven Butala: I do want you to talk about that in a second. Steven Butala: Here’s the great news about this. If you send an offer campaign out correctly for rural vacant land, about every 300 to 350 offers that you send out you’re going to buy a property, you’re going to get about 10 responses, 10 to 15 responses. Some of them are going to be angry that you mailed it, some of them are going to be elated that you mailed it, and they want their 500 bucks or whatever the numbers are, and some are going to want to renegotiate the price. Steven Butala: So when you send out a 1,500-unit mailer, you can almost, if you do it right, use that 300-unit or 350-unit as a multiple. You know how many responses you’re going to get and you know how many properties you’re going to buy. For urban land, infill lots, the number’s close to 1,000, and for houses, the numbers, depending on your pricing, the numbers are 1,500 to 2,000 units and you buy a house. And you can gauge the responses so you’re never blindsided. Steven Butala: Once in a while, you’ll send a mailer out and, like Jill said in our earlier episode, you price it too high so you get no response, you price it too low and everybody signs it and sends it back, but those are far and few in between, or did I reverse it? Jill DeWit: Reverse. Yeah, you did. That’s okay. Steven Butala: This is so predictable. Unlike going to a tax sale auction or perusing the MLS or any of that stuff, you don’t know what’s going to happen. This is a very predictable outcome that’s going to happen, so unless you’re sending out 700,000 pieces of mail a month, which some of our members do, you’re not going to get inundated and that spreadsheet’s going to be fine. Jill DeWit: You’re going to be just fine. Steven Butala: Or if you’re using the existing CRM, you’re a salesperson, just continue to use that, just in a different way. You don’t have to re-learn a new piece of software. Jill DeWit: No. You got this. Don’t be afraid. I’m going to wrap it up with this from me. This is what I talked about last weekend with everyone. They know less than you do. You are the expert. They’re calling you. They don’t talk to many other investors. People don’t really send them letters. That’s usually how it goes. They’re calling you saying, “I just got your letter. This is the greatest thing on the planet. What’s the next steps?” Then they’re up to you to guide them. You have a checklist. I know that. I gave it to everybody. You know what information to collect, so you can do your due diligence and finalize the transaction and purchase the property. Jill DeWit: This is just about keeping track of it and helping you in your head be ready for it when I come in, because the last thing you want … I keep notes here for our show, but when I’m done with it I rip it out and throw it away … This is the last thing you want, is when you’re on the phone with someone, is to go, “Hang on, Mrs. Smith,” and go to a different page. Just be a little more organized, and a spreadsheet will do it, and all kinds of other things like that online. Other programs will do it. That way, you can also pull it up remotely, because if you’re doing it like us, you might be traveling right now. Steven Butala: Yeah, you’re not even in the same ZIP code, right? Jill DeWit: There’s so many of our members that are doing this remotely from all over the world, whether they’re living abroad, working abroad, or just on vacation, and you need to be able to log in and access your notes and do your business. That’s one of the beauties of what we do. Steven Butala: “Yeah, whatever they …” Jill’s whole attitude in life is, “Whatever happens, I’m going to manage it.” My whole attitude is, “Let’s minimize risks.” So between the two of us, I filter what hits her, what gets to her, and she’s completely ready for it now. Jill DeWit: Solves it. Exactly. No, no, it’s perfect. Whatever does get to me, I figure it out and solve it. Steven Butala: It’s filtered, hopefully. Steven Butala: Hopefully it’s easier. Well, you did it again. 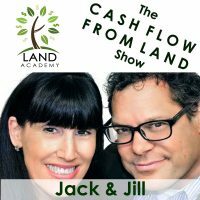 You spent another 15 minutes or so listening to the Land Academy Show. Join us next time, where we cover another interesting real estate topic. Jill DeWit: And we answer your questions, posted on our online community, LandInvestors.com. It’s free. Jill DeWit: Do you know what I was going to say about what you said about failing and everything? I was going to add that, do you know how many times he failed before at women before he found me? Talk about picking the wrong woman. Steven Butala: Yeah, I had to go through 50 or 60 women before you, love. Steven Butala: And the best is always last there. Steven Butala: Unless you’re doing something really wrong. Steven Butala: Oh, my gosh. I wonder if that happens. Steven Butala: I never considered that. Jill DeWit: I do know one person that said to me later on, “Gosh, who knew that that one was probably the best,” and it was way too late to go back. Steven Butala: Were you the that one? Jill DeWit: It wasn’t me. Steven Butala: No, I mean, I hope it’s not you. Steven Butala: I mean, were you the recipient of that? Jill DeWit: Oh, no, no. No, here’s the thing. Oh, no. Jill DeWit: That’s what I mean. That’s what I’m saying. Now, that part is true. Every man before you wishes they would be in your shoes right now. Just kidding. Jill DeWit: I’m just kidding. I’m kidding. Jill DeWit: No, somebody was talking to me and asking my advice about someone and they did say that, “Gosh, I wish I would have proposed to that one,” or something, and like, sorry. Hey, we should cut this off now. Jill DeWit: Share the fun by subscribing on iTunes and YouTube, and while you’re at it, please rate us there.